One person is dead following a three vehicle traffic crash in Escambia County Tuesday morning. The Florida Highway Patrol said Kelvin Antonio Taylor, 35, of Pensacola was northbound on Blue Angel Parkway near Millview Road about 7:30 a.m. when he traveled into oncoming traffic for unknown reasons. He struck vehicles driven by Cody James Ramey, 27, of Pensacola and and Gwendolyn Vaughn Thompson, 71, of Milton. Taylor died at the scene; while Ramey was seriously injured and Thompson was uninjured. In what’s being called a surprising case of animal cruelty, a pregnant cow was found dragged and strangled Monday in the Enon community. The owner of the cow found the animal dead in a pasture just behind his house on Highway 97-A Monday morning as he checked on his animals. Thin twine — often called grass string – had been tied several times around the cow’s neck and had apparently strangled the animal as it was dragged through the pasture. 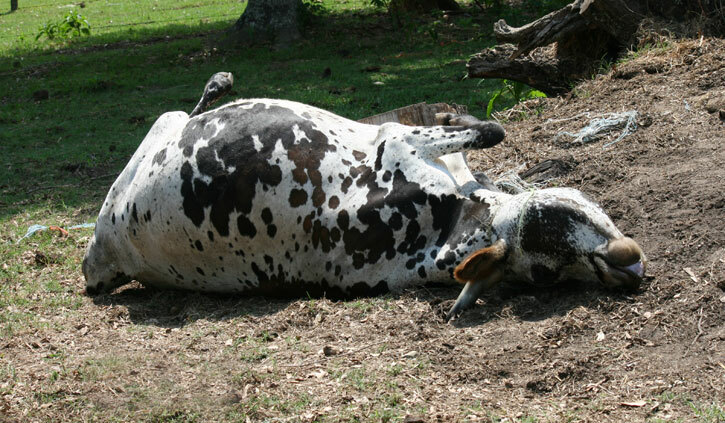 The cow was found on its side, with its head upside down and its horns pushed several inches into the dirt. “I just don’t understand who would do something like this and why,” said the owner of the cow. “It was just senseless.” The owner last saw the cow alive in his pasture Sunday. He said he believed that the incident could have been some sort of prank gone wrong or a case of just cruelty. The Escambia County Sheriff’s Office is investigating the incident. A crime scene investigator responded to the pasture near the Enon Baptist Church to take photographs and collect evidence. The suspect or suspects in the case are expected to face felony animal cruelty charges. Anyone with information about the incident is asked to call Sheriff’s Office at (850) 436-9620 or Crime Stoppers at (850) 433-STOP. 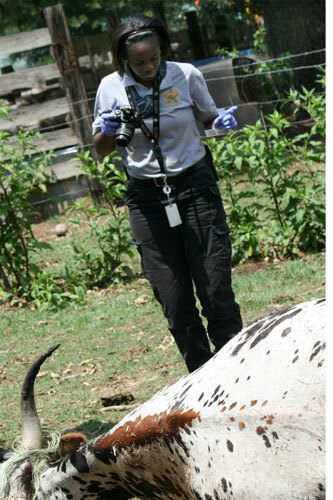 Pictured: An Escambia County Sheriff’s Office crime scene investigator photographs a cow that was apparently strangled to death in Enon. NorthEscambia.com exclusive photo, click to enlarge. 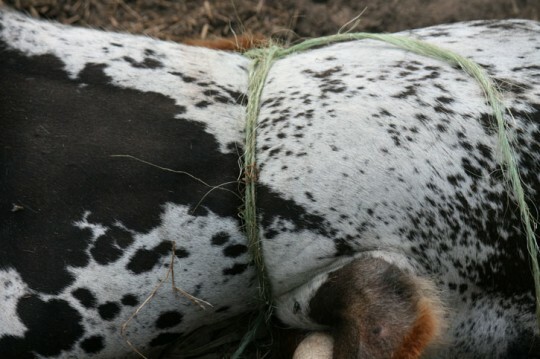 A pregnant cow was found dragged and strangled to death Monday in Enon. For the complete story, click here. These are additional photos from the scene. NorthEscambia.com exclusive photos, click to enlarge. A Flomaton man has been found not guilty of stabbing a Brewton man in the neck outside Odom’s Bar in Century in early 2010. An Escambia County jury took 51 minutes to return the not guilty verdict for Dennis Clyde Mathis, 32, on a felony charge of aggravated battery. A then 27-year old male was stabbed in the neck outside the bar in the 9500 block of North Century Boulevard about 2:20 a.m. on January 16, 2010. Deputies originally had no suspects and no witnesses in the crime, but a tip later led them to Mathis. He was arrested two days later after a traffic stop in Bluff Springs. An Escambia County man is charged with firing a weapon on busy Highway 29 near Walmart in Ensley. 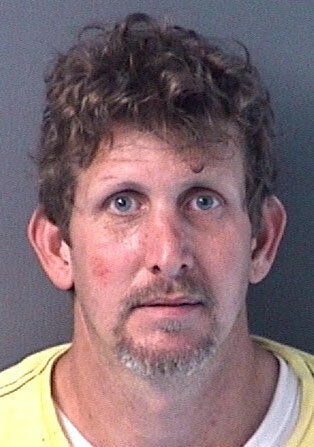 Larry Wayne Kelly, 42, is being held on felony weapons charges in the Esambia County Jail. His bond is set at $575,000. For an update to this story, click here. Multiple people called 911 Sunday evening to report gunshots in the area of the Murphy Oil in front of Walmart. Deputies were unable to immediately determine where the gunshots had originated. Escambia County Sheriff’s deputies were able to later determine that the gunfire came from a Ford Ranger driven by Kelly and gave chase. The short pursuit came to an end when Kelly crashed into another pickup and a deputy’s vehicle at Palafox and Ensley streets. Inside Kelly’s Ford Ranger, deputies found a 12 gauge shotgun, a 38 Special, a Luger TEC-9 and an AK-47 — all loaded. In the backseat of the truck, deputies found the book “The Sociopath Next Door”. Bullet casings were found in a parking lot near O’Reilly Auto Parts on Highway 29 just south of Walmart, and bullets were recovered from a nearby seafood business. The Escambia County Sheriff’s Office is asking for the public’s help in solving three missing persons cases, one of which dates back to 2000. Anyone with information on any of the cases can contact Missing Persons Investigator Troy Brown at (850) 436-9199 or (850) 436-9620. 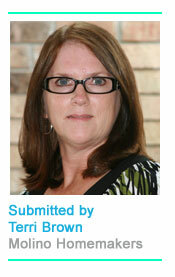 Terry Lynn Hattaway, 57, was last seen on April 19, 2000, in the 700 block of North 79th Avenue. Family members said Hattaway took medication for schizophrenia and anxiety. 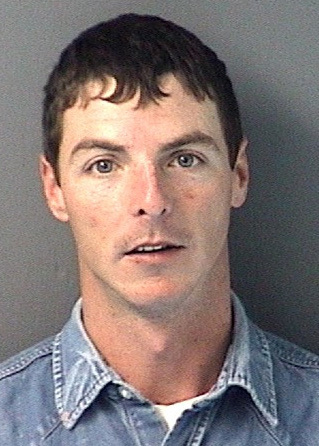 Craig L. Hoskie, 25, was last seen on April 11, 2008, on Pensacola Beach. Hoskie, who was in the United States Navy, is presumed to have drowned but his body was never recovered. Glen Wayne Albert, 56, was last seen on March 21, 2009 in the 2600 block of Michigan Avenue. Family told deputies that Albert had suffered from depression and left his home with a gun. He left his car, cell phone and wallet containing his identification and money at his residence. Escambia County Students of the Month for May have been named by the Escambia Association for Administrators in Education. The awards are presented monthly to two students from participating schools. Northview: Kasie L. Braun, ninth grade; La’derious T. Franklin, 10th grade. Mr. Lamar Smith, 65 of McDavid and formerly of Repton, AL, died Monday, May 30, 2011, in Pensacola. He was employed with Piggly Wiggly as a meat cutter. Smith was born in Pineapple, AL, on August 19, 1945, to the late Ivey Franklin and Lillie Harring Smith. He was preceded in death by his wife, Dianne D. Smith. He is survived by a son, Chris Smith of McDavid; two brothers, W.C. Smith of Fort Lauderdale, and Jimmy Weatherspoon of Frisco City; two sisters-in-law Gail Cotton and husband John of McDavid, Faye Coover and husband Dusty of Repton; and one grandchild Alexa Tullis. Services will be Wednesday, June 01, 2011, at 3:00 p.m. from Johnson-Quimby Funeral Home Chapel with Bro. Bobby Boatwright officiating and Bro. Rogene Booker assisting. Interment will follow in Oak Hill Cemetery Atmore. Active Pallbearers will be Jonathan Cotton, Chester Fawley, Doug Purvis, Leroy Tullis, David Adams and Wayne McGhee. Family will receive friends Tuesday evening May 31, 2011, at Johnson-Quimby Funeral Home from 6 p.m. to 8 p.m.
Johnson-Quimby Funeral Home Inc. Atmore, AL. is in charge of all arrangements. Matt Dobson of Jay was the overall winner in the 26th annual Memorial Day Gate to Gate 4.4 Mile Run/Walk at Eglin Air Force Base Monday morning. The 41-year old Dobson’s winning time was 24:21, just ahead of second place finisher Thomas Howell, 15, of Niceville. The top female runner was Pasca Cheruiyot, 22, of Tallahassee. She finished in fifth place overall with a time of 25:18. One other North Escambia area runner placed in the race — William Robertson, 26, of Cantonment was 227th overall with a time of 36:13. 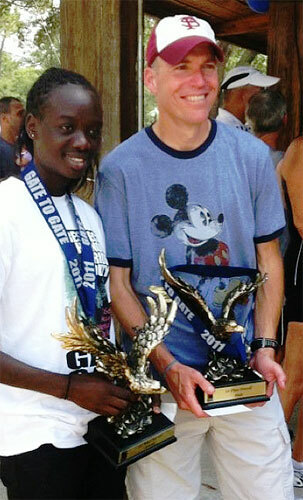 Picture: Overall male and female champions in the 26th annual Memorial Day Gate to Gate 4.4 Mile Run/Walk at Eglin Air Force Base Pasca Cheruiyot (left) of Tallahassee and Matt Dobson (right) of Jay. Courtesy photo for NorthEscambia.com, click to enlarge. 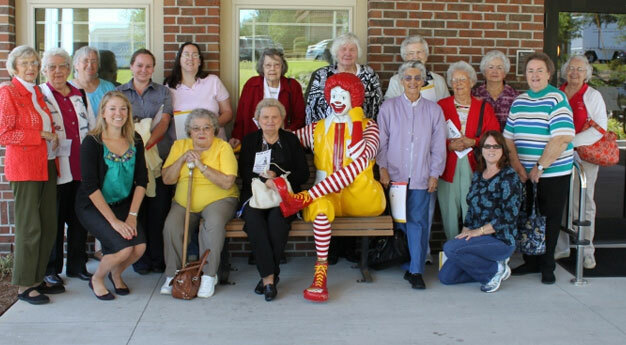 The Molino Homemakers recently took a tour of the Ronald McDonald House in Pensacola and presented them with 50 handmade tote bags. A tour of the new facility on Bayou Boulevard, which opened in August 2010, was given by Stephanie Cornell. A short film was shown as an overview of the service Ronald McDonald house offers to families who need a place to stay while a family member is in the hospital. Cornell said there were a few requirements to be able to stay at the Ronald McDonald House. The two main requirements are a child age 0-21 in the hospital for treatment and the family must live at least 10 miles away from the hospital. After the film Cornell took the Homemakers on a tour of the many different rooms from check-in to the family room, kitchen, laundry, bedrooms and playground. There are 26 bedrooms in the new facility — a home away from home for families in need. The Ronald McDonald house operates on donations which are greatly appreciated. For a list of items needed or to learn more about the Ronald McDonald House visit www.rmhc-nwfl.org or call (850) 477-2273. At the close of the tour the Homemakers presented Cornell with 50 homemade tote bags for families that use the facility. The ladies enjoyed lunch and fellowship at Picadilly Deli. The next Molino Homemaker meeting will be Wednesday, June 1 at 10 a.m. at Aldersgate United Methodist Church in Molino. Visitors are welcome; dues are $5 per year. Pictured top: The Molino Homemakers recently toured the Ronald McDonald House in Pensacola. 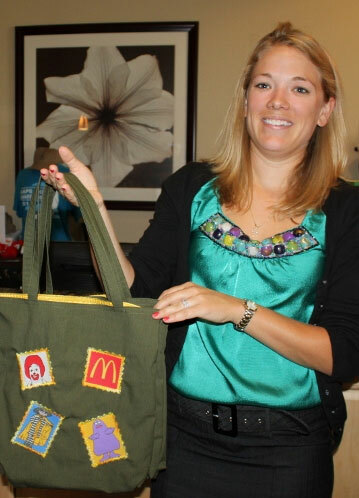 The group presented Stephanie Cornell of the Ronald McDonald House with 50 homemade tote bags for use by the residents. Submitted photos for NorthEscambia.com, click to enlarge.